GAZA CITY, Gaza Strip The Hamas government of the Gaza Strip has for the first time appointed a woman to represent it to the world. The hiring of Isra Almodallal as a spokeswoman for the territory's conservative Islamist rulers is part of a long-running push by the group, which has at times sought to curb women's freedoms, to present a newer friendlier face both to its own citizens and internationally. Almodallal, a 23-year-old who speaks fluent British-accented English, has assumed a post normally held by tough-talking men who voice Hamas' bitter opposition to Israel. She will be responsible for the Gaza government's communications with the international media. "We are looking forward to having a different and unique language," said Almodallal in an interview in her Gaza City office, on her first week in the job. "We will make the issues more human." The change in policy began six months ago when a new head of the government media department, Ihab Ghussein, took over. He hired younger media people, started a new official government website, began rampant use of social media and started conducting seminars and workshops. Ghussein said he appointed Almodallal in an effort "to be more open to the West." He said many women were among the dozens of applicants considered for the position. "Women are partners in our society," Ghussein said. Almodallal, a divorced mother of a four-year-old girl, does not have her roots in the Hamas movement. Unlike many other Hamas officials, her office does not bear a photo of Gaza's Prime Minister Ismail Haniyeh. She keeps a book on American history there, alongside the Quran. She was raised in Gaza and spent five years in Britain as a teenager, studying at Grange Technology College, a high school in Bradford in the U.K. Upon returning to Gaza, she studied journalism at the Islamic University, and worked as a TV reporter for a local station and an English-language satellite channel, which she said taught her how to present herself on camera. 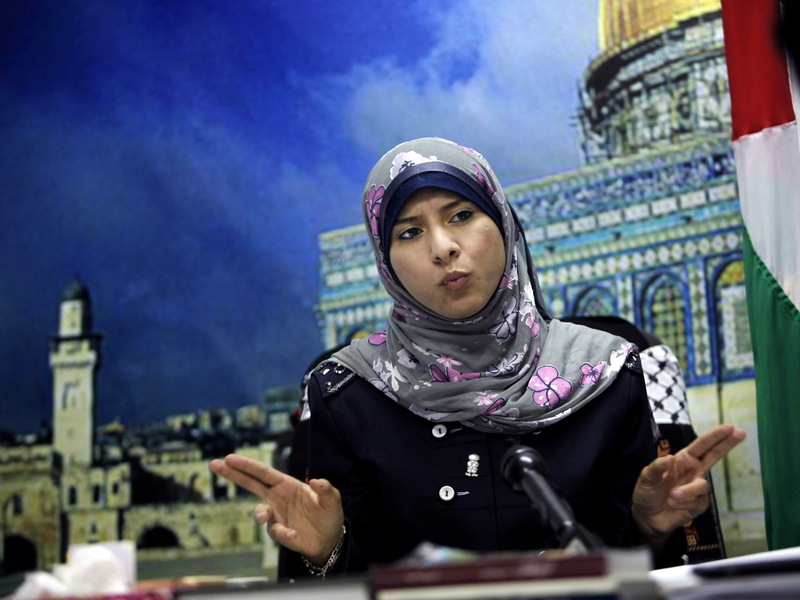 Her appointment is the latest step by Hamas to manage its image. "Hamas, as any other government in the world, want others to listen and believe in them," said Moean Hassan, a lecturer in media at Gaza's Palestine University. Since the group overran the territory in 2007, it has cautiously attempted to enforce its deeply conservative version of Islam and has at times placed some restrictions on women's behavior. But it has refrained from passing sweeping Islamic legislation, apparently fearing a public backlash, despite criticisms form ultraconservatives who say it is not implementing Islamic law quickly enough. Under Hamas, there has been mounting social pressure on women to cover up in the traditional Islamic dress of long robes and headscarves. The Hamas government has also banned them from riding on the backs of motorbikes and from smoking water pipes, but these rules have not always been enforced. Earlier this year, the Hamas government barred girls and women from participating in a U.N.-sponsored marathon, prompting a U.N. aid agency to cancel the race. At the same time, women are permitted to work, drive and hold public office, with one female minister and six female deputy ministers serving in the Hamas government. Some 20 per cent of public servants working for Hamas are women. Almodallal asserts that women in Gaza are finding their way into politics, medicine, education and media. "Every day, women's footsteps can be seen advancing more in society," she said. Almodallal takes a slightly different line than many Hamas spokesmen. She refers to "Israel" rather than the "Zionist entity." And she does not consider herself a Hamas loyalist, saying she would be equally willing to work as spokeswoman for the rival Palestinian government in the West Bank. But she does believe - in line with the Hamas position - that the Palestinians should control all of historic Palestine, or the land between the Mediterranean and the Jordan River, including what is now Israel. She speaks primarily about Gaza government affairs: education and social programs or the Israeli blockade of the territory. She will not discuss Hamas suicide bombings and other attacks, which have killed hundreds of Israelis over the years. Not will she be handling the sensitive reconciliation attempts with the rival Palestinian government in the West Bank. Spokesmen for the Hamas movement, as opposed to the Gaza government, deal with those subjects. She takes up the job at a challenging time for the movement. Hamas lost a key ally with the downfall of its parent movement, the Muslim Brotherhood, in neighboring Egypt after a July 3 coup. The group remains a pariah to many nations in the West. "I know it's a big responsibility and it's not easy to speak on behalf of a government in normal situations, whereas I am working in unique situations," she says.